Congratulations to "Taurus", the winner in Jannine's giveaway. Thank you to all who participated! Thanks for having me on your blog today! I’d like to discuss a controversial topic. No, not politics! I see enough of that on social media… But, Every Vow SheBreaks does have an unusual and dubious element involved in the storyline. Bigfoot. I grew up in the heavily forested area of Northern California where tales of Bigfoot encounters are prevalent. When I set this book in the Redwood Forest, I couldn’t resist adding a bit of folklore… However, I didn’t want readers to think I was a complete loon, so I had to handle the topic carefully. I introduce a group of somewhat whacky scientists who are searching for Bigfoot. My heroine is writing an article on their activities for a nature magazine and hoping for a sensational photo to boost her career. So, the question becomes, do they actually see a Bigfoot? Or not? I tried to leave it up to the reader to decide if the big, furry creature was a bear…or a Bigfoot. Here’s a short excerpt. You decide. A hand brushed her back, tangled in her hair. She jerked away and cried out as strands ripped from her scalp. “No. No. No.” Her toe caught the edge of an exposed root. Arms flailing, she stumbled forward and kept running. 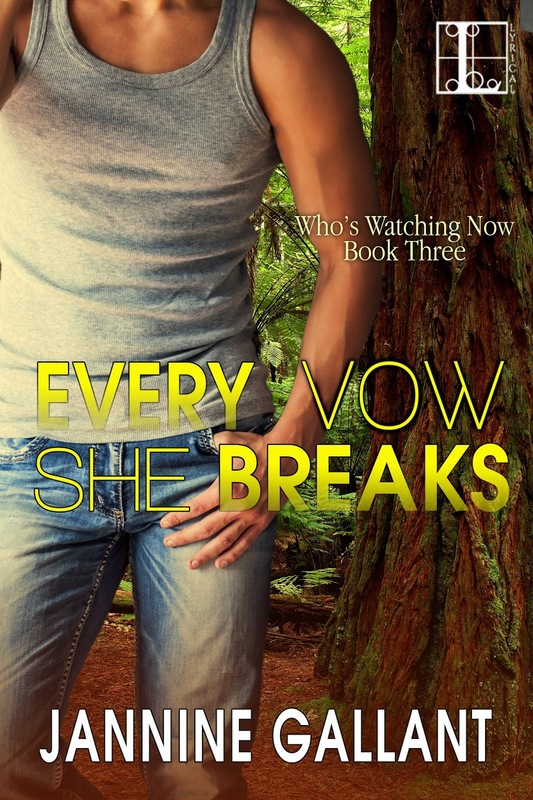 I’m giving away an e-copy of Every Vow SheBreaks to one lucky commenter. So, tell me, does the idea of Bigfoot add to the mystery and make you more interested in reading the book…or do you think I’m completely crazy? I live in Washington state...also Bigfoot country. I think the idea of Bigfoot is a great added mystery to the story! Glad you like the idea, Trude. Thanks for stopping by! i love the idea of Bigfoot being included! I don't believe in paranormal stuff in real life, but I do still enjoy reading about them! Thanks for the fun post and congrats on the new release! I'm not a big paranormal fan, but I thought the idea of Bigfoot was kind of fun. Thanks for commenting! Maybe a little crazy...LOL Yeah, spine tingling is always good! The Bigfoot mystery plays a small role in the book. The suspense plot has a lot of depth to it, Colleen. I already read the book and loved it! Fantastic ending to the "every" trilogy. I loved the Big Foot angle, the setting and the romance/suspense, of course. Great job. So glad you enjoyed it, Leah! I love the Big Foot element! Very cool. I haven't read it, I'm ashamed to say, but I plan to soon. The excerpt definitely motivated me. Great job! Great job working in the sort of paranormal in a very interesting way. Kept me guessing all the way through the book. Which I LOVED - BTW! I think adding in Bigfoot sounds like fun. It really was fun adding the Bigfoot element! You could be right, Mandy! Glad you see the potential! I enjoy reading paranormal stories, so having Big Foot included in the story line isn't odd at all. Hey, I hadn't thought about acquiring new readers from a different genre. Bonus! I agree, doesn't matter what is chasing you. You bring out the heroine's fear and that gets us involved. Nice work! Local "monsters" are always of interest--even when they are re-located across the country. Love the excerpt!